Why Should You Get Help with Salesforce? Need a Mobile App for Salesforce? You've tried calling Tech Support. You've tried reading "Salesforce.com for Dummies" and you are still having difficulty. Get The Guidance You Need! We recognize that our clients are seeking to maximize their return on a system that is sophisticated (and therefore complicated) and they need help. We are available to listen to your needs, provide direction, support, training, and the answers that keep you moving forward. A Little Expert Advice Goes A Long Way! If you are not taking advantage of the full functionality of Salesforce Reports and Dashboards, then you’re missing out on the most significant benefit of this CRM system. The ability to create good reports is critical! 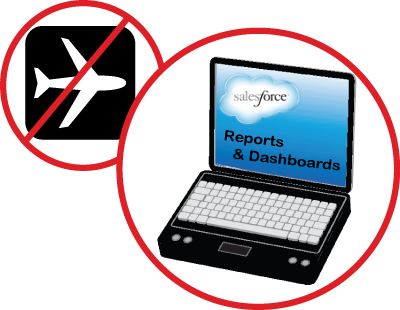 We Build Salesforce Reports and Dashboards For You: We are available to build any report or dashboard that your company needs. We have built literally thousands of reports and dashboard elements. There are a lot of little tricks to building a good report. We can save you lots of time by building the ones you need. We are available on-demand to meet this need. Train You To Build Reports and Create Dashboards: We can train you or your team in the fundamentals of report writing and dashboard development. “Mike and his team have provided that important level of experience, and expertise about Salesforce, sales reporting and system administration. Today, we enjoy solid insightful information about our business that is allowing us to make well informed business decision about our team, our business, and the direction that we will take based on sales trends. You can’t do better than these people.” Read more. 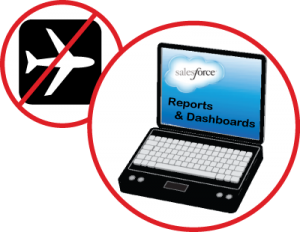 Would You Like Us To Create The Salesforce Reports and Dashboards You Need? If you need a specific report and don’t want to learn how to create it yourself, we can do it for you. We simply talk to you about what kind of data you need from your Salesforce system and we’ll create the report to show you that data in the exact format you need. We’ll even show you how to export it or have it emailed to you on a daily basis. Then you might want to have that data presented on a Dashboard, we can take care of that also. “Mike and his team have made our sales and operations divisions more efficient by helping create reporting, job costing, and data management systems. I highly recommend Mike and the team at Snapptraffic Consulting… they are a pleasure to work with!” Read more. Not Sure What Dashboards You Really Need? If you aren’t even sure what to ask for, but know you need better business intelligence, we can build a set of reports and dashboard elements for you. We’ve worked with hundreds of businesses and know thoroughly the kinds of information that feeds their decision making processes. 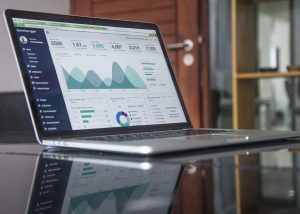 We’ll spend some time discussing your business model, and based on that conversation we’ll build a set of reports and dashboards that we think will best provide a good starting point – then based on your feedback we’ll tweak those over the following weeks to provide exactly what you need. Snapptraffic consultants work on an hourly basis (current rates). The typical custom report will take us less than a half hour to create for you. We spend a few minutes on the phone discussing your needs, then build the Salesforce reports and dashboards you need. This can be done quickly and inexpensively. No ongoing fees, no program fees. Just what you need, when you need it. We have a Salesforce reports and dashboards building training program that we can take you or any of your employees through. In about an hour and a half, we’ll cover the basics of Salesforce reports and dashboards that will enable you to build the systems necessary to gain valuable visibility into all your vital business processes. In order to conduct this training inexpensively, we use online meetings to meet with up to 15 people at one time on a conference call and on their computers wherever they work. Together we will build actual reports that your business can use right away and in the process your team will learn what they need to know to build their own reports and dashboards. After training, you may decide that you like having someone available to answer questions about any aspect of Salesforce. As consultants, we become an on-demand extension of your team. Whenever you or any member of your team need help with customization, adoption strategies, layouts, reporting, you name it – just call or send an email, and we’ll schedule time to meet with you and get your problems solved. It matters to us that you receive value from every session we have together or from every hour that we spend working on your system when we are not together. If you are not satisfied with our work, we will remove that charge from your bill.